Michigan has a long history of safeguarding wildlife populations, including grouse, pheasant, elk and turkey. 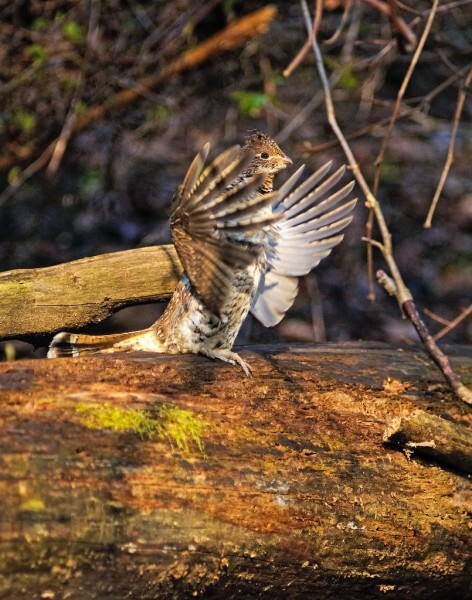 Seeing the secretive Ruffed Grouse can be quite difficult – although it can be easy to hear them when they’re drumming. Click here for video. “The Grouse Machine” serves “The King” – and in the process, various habitants of Michigan’s forests benefit. 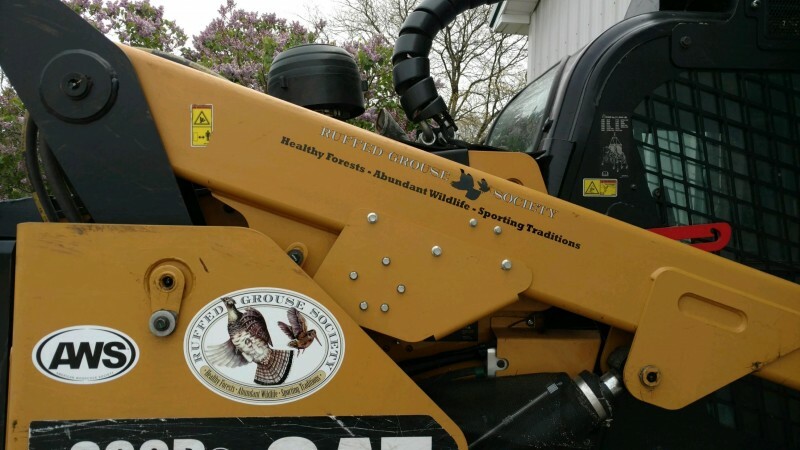 The machine is a Caterpillar skid steer with a forestry-mulching head that the Ruffed Grouse Society uses to create habitat for the organization’s namesake bird, nicknamed “The King” because of its elusiveness and wildness. An operator drives the equipment, grinding up overgrown plants. This reinvigorates habitat and allows new growth that feeds and provides cover for grouse, as well as other crucial species including American woodcock, elk, migratory songbirds and white-tailed deer. “It’s really a textbook case of conservation management – using scientifically proven techniques to help ensure a healthy wildlife population today and into the future,” said Matt Pedigo, chair of the Michigan Wildlife Council. The council was created in 2013 to build awareness about the importance of wildlife management and conservation – and what is required to ensure that Michigan’s forests, waters and wildlife can be enjoyed for generations to come. Spotting a ruffed grouse is often a crowning achievement for Michigan nature lovers. The name “ruffed” grouse comes from its long, shiny, black or chocolate-colored neck feathers that are most prominent on males. When in full display in defense of his territory, or showing off to an interested hen, these feathers are extended into a spectacular ruff, which together with a fully fanned tail, makes him look twice his normal size. Somewhat larger than pigeons, ruffed grouse live their entire lives in wooded areas. 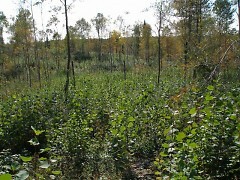 They thrive in what’s known as “young forest.” These immature aspen stands and brushy areas help protect nesting grouse and provide an ample, year-round food supply. In the Great Lakes, the ruffed grouse’s numbers have fallen as forests have grown older. But the bird’s population can often be readily restored by proper harvest of forested lands, or through the judicious use of prescribed burns. Under 68-year-old Paige’s direction, the Ruffed Grouse Society uses its machine to grind up overgrown trees, shrubs and brush on parcels as small as half an acre to as large as 50 acres. Paige, Shaw and the 20 Ruffed Grouse Society chapters in Michigan work with local, state and federal agencies, as well as private landowners and other conservation groups that are interested in restoring land into young forest for the variety of species that depend on it. The work takes place year-round with more than 3,600 acres regenerated since 2009, when the Ruffed Grouse Society began this project. “Healthy forests lead to abundant wildlife, which allows us to continue our sporting tradition,” said Paige, who lives in Lapeer. Hunters and fishermen do far more than support conservation philosophically – they also back it financially. Contrary to popular belief, taxes do not pay for the management of our natural resources. In fact, sportsmen, through the purchase of hunting and fishing licenses, fund the bulk of the state’s conservation and wildlife management activities. “So every time a hunter or angler purchases a license, tag or permit, that money is funneled to the Michigan Department of Natural Resources for activities such as habitat improvements and invasive species control,” Pedigo said. The sale of hunting and fishing licenses generated an estimated $63.2 million in fiscal year 2015-16, according to DNR records. Sportsmen also contribute to the economy through the purchase of sporting arms, ammunition, archery equipment and handguns. In 2016, Michigan received a combined total of nearly $34 million from the U.S. Fish and Wildlife Service for wildlife conservation from excise taxes on fishing and hunting equipment. Many sportsmen and outdoor groups have as members or work in coordination on conservation projects with Michigan residents who don’t hunt or fish but enjoy other outdoor activities, such as hiking or bird-watching, Pedigo noted. “These people benefit from scientific management of our outdoor resources, too,” he said.